If you haven’t reviewed the introduction to my fantasy football metric, “Actual Opportunity.” I highly suggest looking that over before diving in here. After already looking at the running back position, below I will be taking an in-depth look at the wide receiver position through the lens of this metric and analyzing what this means for the 2018 fantasy season. In 2017, WR1s, WR2s, and WR3s all hit decade-lows in fantasy points scored. Last season, wide receivers combined to total 16,027 fantasy points, or 1,653 fantasy points off of their trailing five-year average. In this article, we explained what went wrong and why there’s cause for optimism heading into 2018. See below for a list of the wide receivers who ranked top-32 from an Actual Opportunity (expected fantasy points) per-game basis. Notes: Players needed four games to qualify. All references to Actual Opportunity and fantasy points are in terms of PPR scoring. After leading the position with 20.5 expected fantasy points per game last year, Brown now owns three of the top-10 seasons by a wide receiver this past decade. He’s ranked top-two in expected fantasy points in each of the past four seasons, and No. 1 in fantasy points per game in each of the past three seasons. On top of having the best workload of any wide receiver over the past five seasons (19.3), he’s also the most-efficient, tied with Doug Baldwin for most fantasy points per game over expectation (2.55) during this span. He should be selected as the first wide receiver off the board in every fantasy league. Hopkins’ 2017 workload was slightly behind Brown (20.4) but still ranked ninth-best this past decade among wide receivers (his 2015 season ranked third-best this past decade). Hopkins saw 27 end-zone targets last season, which was the most by any receiver this past decade. He also led the position in targets (164), yards in air (2341), and expected touchdowns (11.3). Per-game fantasy efficiency was only slightly above average for Hopkins (+0.4) but looks much better when contrasting Deshaun Watson starts (+3.6) with all other games (-1.7). Now that he’s finally saddled with a competent quarterback, I’m drooling over his potential and have moved him all the way up to No. 5 overall (just behind Brown) in my rankings. Over the past four seasons, Beckham ranks third, third, sixth, and third in expected fantasy points per game. He joins Brown as the only wide receiver with at least three top-three finishes over this stretch and ranks second (with Jones third) in both expected and actual fantasy points per game over this span. Meanwhile, Jones’ volume was much better than his production seems to have implied, ranking fourth in expected and 10th in actual fantasy points per game. The issue for Jones, as we mentioned here, is, he was uncharacteristically unlucky in the touchdown department. He totaled 10.0 expected touchdowns but only scored three, marking the largest negative differential of the past decade. Considering he was fairly efficient in this department throughout the rest of his career and touchdowns are fairly random, I expect a significant positive regression for Jones in 2018. Jones also led all wide receivers in expected fantasy points per route run, but as I’ve written about elsewhere, the lack of total routes per game is a concern for fantasy. I slightly prefer Beckham, but both are worthy of first-round picks. After Brown, Beckham, and Jones, Evans ranks fourth in expected fantasy points per game since entering the league. He ranked fifth-best last season, after ranking best in 2017. While volume has been tremendous, efficiency has been poor. Of 833 qualifying wide receiver seasons (min. 50 targets) this past decade, Evans’ 2015 and 2017 seasons both rank bottom-20 in fantasy points above expectation. He also posted a negative differential in 2016. This could mean one of several things. Perhaps Evans is a tad overrated relative to public perception, or perhaps the inefficiency is due to Dirk Koetter’s scheme or Jameis Winston’s own deficiencies (we speculated as much here). I want to say he’s a strong positive regression candidate heading into 2018, but his career efficiency numbers imply poor efficiency on good volume might be something we’ll just have to live with for fantasy. Still, given the immense volume, he remains a WR1 in my rankings (No. 8 at the position). Over the course of the full season, Allen averaged 16.2 expected fantasy points per game, which ranked seventh-best, but was actually less than in his last full season of work (17.3). Allen’s volume wasn’t tremendous to start the year, but he led all positions in both expected and actual fantasy points over the final seven weeks of the season. It’s possible that sort of volume continues after the team lost tight end Hunter Henry (62 targets last season) for the year and Los Angeles went 5-0 in the five games Allen totaled more than 11 targets. Over the past six seasons, Green has ranked ninth, fifth, 21st, 11th, second, and fourth in expected fantasy points per game. In actual fantasy points per game, he’s ranked 14th, fifth, 13th, ninth, sixth, and third. At worst, he feels appropriately priced (ADP WR8) with very little downside. There’s room for a larger workload with Brandon LaFell (and his 89 targets last season) now out of the picture. Efficiency should improve as well, after Andy Dalton hit a career-low in adjusted net yards per attempt. Green averaged 0.5 fantasy points per game below expectation last year, compared to 2.2 over his prior three seasons. Hilton ranked 36th in expected fantasy points per game last year (11.1), but ranked seventh-best in 2016 (16.4). If Andrew Luck were guaranteed a full 16 healthy games, Hilton should have an ADP at least a full round higher than where he’s typically being selected (3.03). Throughout his career, Hilton averages 15.1 fantasy points per game with Luck in the lineup and only 11.3 without. For perspective, that would have been the difference between finishing 10th and 31st at the position last year. Last season, Thielen ranked 11th in both expected and actual fantasy points per game, while Diggs ranked 24th and 14th, respectively. While Thielen was better across the full season, Diggs averaged 19.4 expected fantasy points per game over the final four games of the season (including postseason) to Thielen’s 13.1. Diggs also trumped Thielen in per-game efficiency (fantasy points per game over expectation) but Thielen beat out Diggs in yards per route run. Given the upgrade at quarterback from Case Keenum to Kirk Cousins, both appear to be decent values. I have Thielen ranked as my 11th wide receiver in PPR leagues to Diggs’ 14th, which is below the respective ADP of each (WR13 vs. WR16). As outlined here, Baldwin is arguably fantasy football’s most efficient wide receiver. He has a long history of significantly outproducing his lowly volume-based expectation. 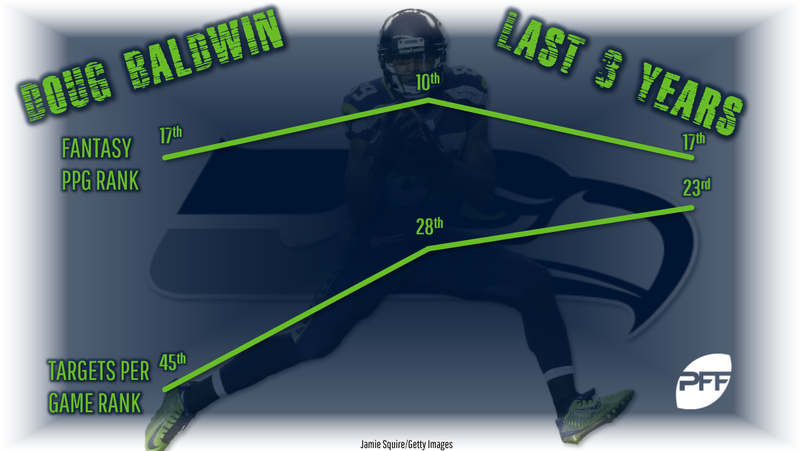 Baldwin ranks 32nd, 28th, and 41st in expected fantasy points per game over the past three seasons. In terms of actual fantasy points per game, he ranks 17th, 10th, and 17th over this stretch. As outlined in the linked article above, there’s a good chance Baldwin’s expectation hits a new high (and by a good margin) in 2018, making him a strong value at current ADP (WR11). Over the past two seasons, Hill ranks as our most efficient wide receiver on a per-game basis, averaging 3.6 fantasy points per game over his expectation. In 2016 he ranked 57th in expected fantasy points per game but finished 29th in actual fantasy points per game. Last year he ranked 28th in expected but seventh in actual fantasy points per game. I suspect he’s overpriced and volume will decline after Kansas City made Sammy Watkins the fifth-highest-paid wide receiver in the NFL, but I also think he’s going to continue to blow past his volume-based expectation. Hill has ranked top-six in yards per route run in each of the past two seasons and might just be one of the best wide receivers in the NFL. Smith-Schuster was otherworldly in his rookie season. As I wrote here, his 2.16 yards per route run average ranks fifth-best among rookie wide receivers this past decade. In terms of WR rating, his 2017 season ranks first among all rookies over this span (134.0). He scored 4.4 fantasy points per game above his expectation last year, which led the position and ranks 12th-best among all wide receivers this past decade. He’s due for an efficiency regression, but perhaps volume improves given his effectiveness and the loss of Martavis Bryant (84 targets last year). Thomas and Sanders both appear to be strong regression candidates and good ADP values. Last season, Thomas ranked 10th and Sanders ranked 28th in expected fantasy points per game, well above their current ADPs (17th and 36th, respectively). In 2016 they both ranked top-15 in expected fantasy points per game, with Sanders actually finishing ahead of Thomas (16.0 to 15.1). They both fell well short of their expectation last year but I’m willing to blame much of that on poor quarterback play. Trevor Siemian and Brock Osweiler both ranked bottom-five in PFF grade last year, while new starter Case Keenum graded out ninth-best of 39 qualifying quarterbacks. Sanders also had to contend with a recurrent ankle injury for much of the year and that doesn’t seem to be factored into his current ADP. Prior to Garcon’s Week 8 injury, he ranked ninth in expected fantasy points, despite minimal volume near the end zone (zero targets in the end zone or within the 10-yard line). His production wasn’t as strong as his volume, ranking 22nd in actual fantasy points, but still falls well above his current ADP (WR32). While his fantasy production wasn’t stellar, our graders were quite impressed with his performance. Garcon graded out 19th-best as a receiver last year and actually ranked even better in 2016 (eighth-best). Factoring in the quarterback upgrade from C.J. Beathard and Brian Hoyer to Jimmy Garoppolo, Garcon is easily one of the best wide receiver values in current drafts. Parker ranked 16th in expected fantasy points per game last season and, despite Jarvis Landry leaving for Cleveland, he ranks just 39th at the position in ADP. His efficiency was poor, but this can partially be explained away by injuries and an extremely tough cornerback schedule (as well as dreadful efficiency from Jay Cutler). Similarly, Stills ranked 35th in expected fantasy points per game last year and ranks just 54th in ADP this year. Given head coach Adam Gase’s track record, both appear to be strong values. Gase’s WR1 has averaged 16.0 expected fantasy points per game and his WR2 has averaged 13.6 throughout his career as an NFL playcaller. Among active playcallers over the past decade, these numbers rank sixth-best and best, respectively. Albert Wilson is also a sneaky value (as I outlined here), typically going undrafted in most leagues, after ranking top-five in fantasy points over expectation on both a per-target and per-game basis last year. 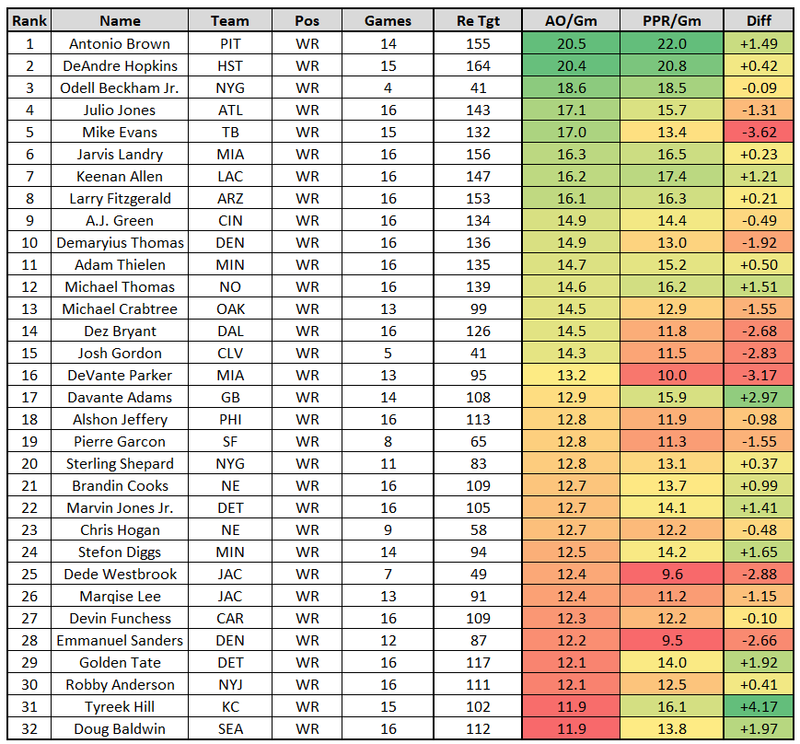 Jackson ranked 34th in expected fantasy points per game last year but ranks just 66th in ADP. Relative to volume, his fantasy production was poor (46th in fantasy points per game), but I’m expecting a massive positive regression next season. Jackson averaged 3.1 fantasy points per game over his expectation across the prior four seasons, which ranked best among all wide receivers over that span. He played well last year (at least better than production implies), ranking 16th-best in PFF receiving grade, and I suspect the issue was just poor chemistry with his new quarterback, as head coach Dirk Koetter has implied. They’ve worked together on this issue all offseason, and Jackson currently ranks as one of my top sleepers at the position. I don’t think Doctson is getting the hype he deserves. Paul Richardson has underwhelmed in camp thus far, while Doctson has stood out. This offseason, Redskins head coach Jay Gruden said he wanted Doctson even more involved in the red zone, but Doctson was already brimming with touchdown upside. Doctson saw 16 targets in the red zone last season – 11th-most among wide receivers. 22 percent of Doctson’s targets came in the red zone last season, or the most of any wide receiver. 22 of his 78 career targets have also come in the end zone (28.2 percent). For perspective, the next-closest wide receiver (by 2017’s numbers) was Michael Crabtree with only 18.2 percent. Considering he has only six career touchdowns to his name (compared to 10.3 expected touchdowns), Doctson is a due for some positive regression in this department. Add in the potential for an even larger role near the end zone and he’s a glaring value in PPR leagues (WR55), though I might like him even more in standard leagues.